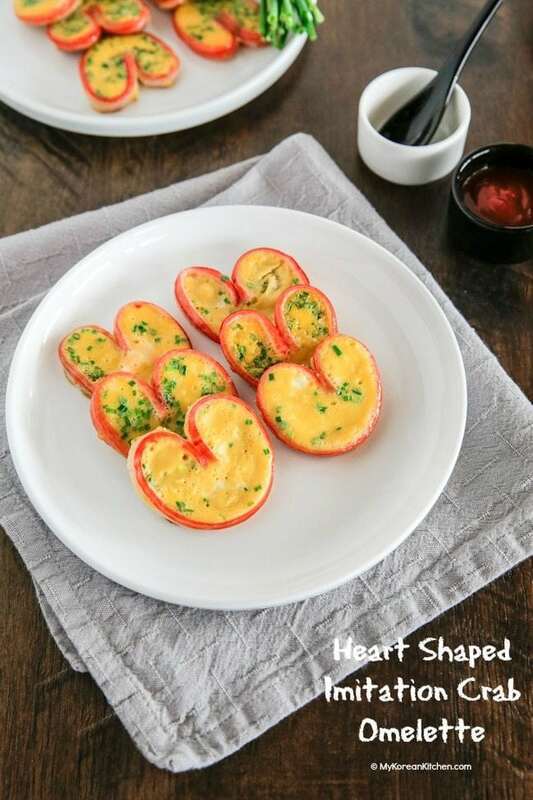 Heart shaped imitation crab omelettes are creative mini egg omelettes made with imitation crab meat. They are perfect for someone who likes expressing their affection with their food! 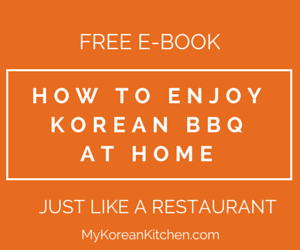 Today I want to share an easy, simple and trendy Korean recipe called Heart Matsal Jeon (하트 맛살전). 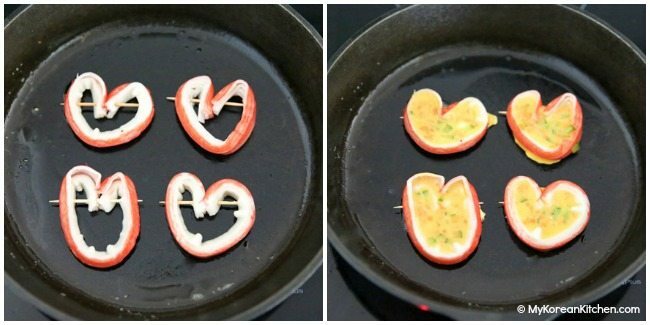 It means heart shaped imitation crab omelette. 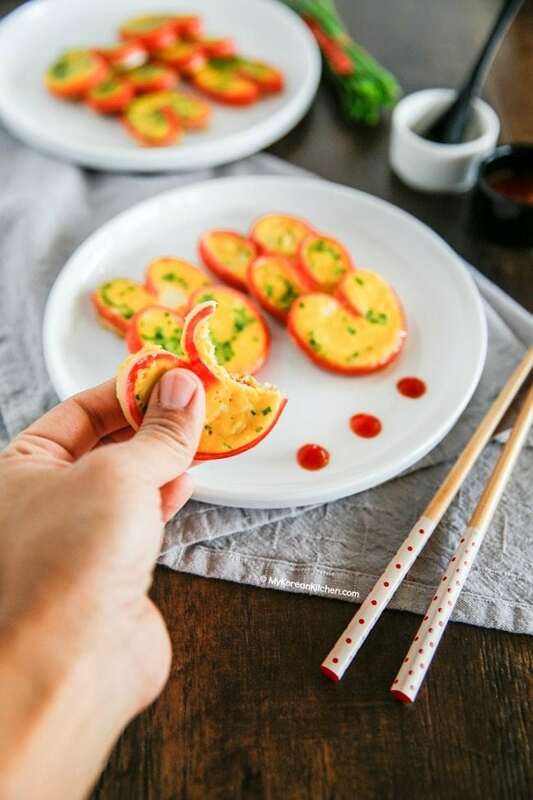 I don’t know who came up with this creative Korean side dish originally, but I really love how it presents so cute and pretty. 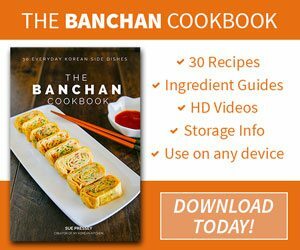 If you are into making bento style lunch boxes, this will hit the spot immediately. 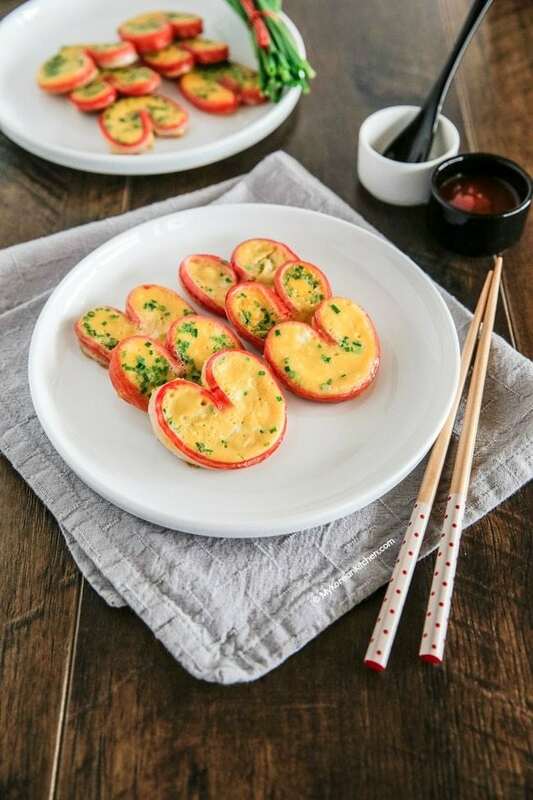 I first discovered these heart shaped imitation crab omelettes on Instagram during the Korean harvest festival period (last week). 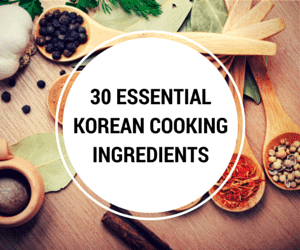 Jeon (전) is a type of Korean pancake, and it is very common to serve them during Korea’s festive holidays. Stuffed Shiitake mushrooms are also a type of pancake that people make during these times. 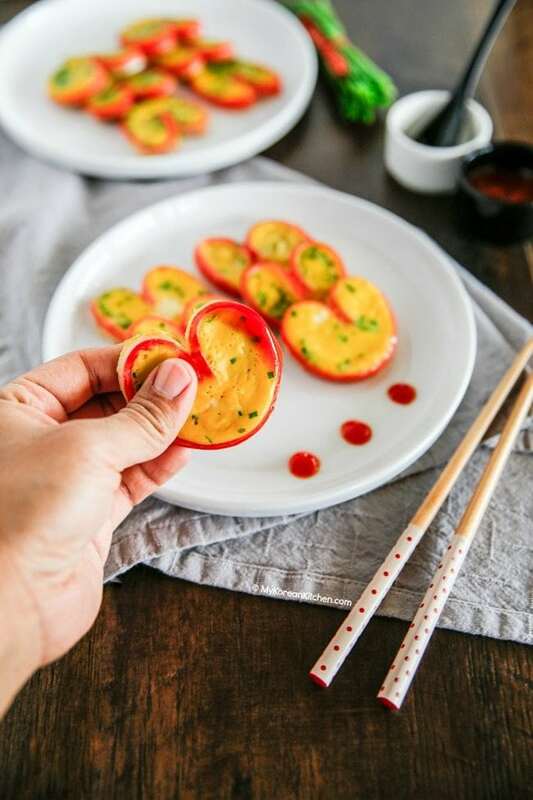 So when I spotted some Koreans serving these heart shaped imitation crab omelettes I thought it would be so fun and cool to make! So I decided to try it myself at home. 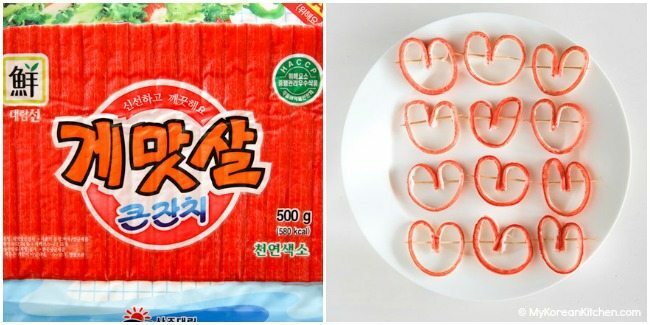 Making heart shaped imitation crab sticks are not difficult but it can be tricky as they may not be as flexible as you would like. Though the more you make them, the better looking your heart will be, so don’t get discouraged if they aren’t pretty on your first try! 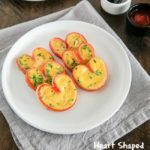 Heart shaped imitation crab omelettes are cheap to make and only require 5 very accessible ingredients. I hope you give these a try soon and show your love to your loved ones! 1. Cut the crab sticks. Each one down the centre, lengthwise and then down the centre again for each. (So now you have four long sticks.) Bend both ends of crab sticks inwards to make the heart shape. Put through toothpicks or skewers to hold the shape in place. 2. Mix the egg, your choice of vegetables and salt in a mixing bowl. 4. Serve with some tomato sauce/ketchup. Cut the crab sticks. Each one down the centre, lengthwise and then down the centre again for each. (So now you have four long sticks.) Bend both ends of crab sticks inwards to make the heart shape. Put through toothpicks or skewers to hold the shape in place. 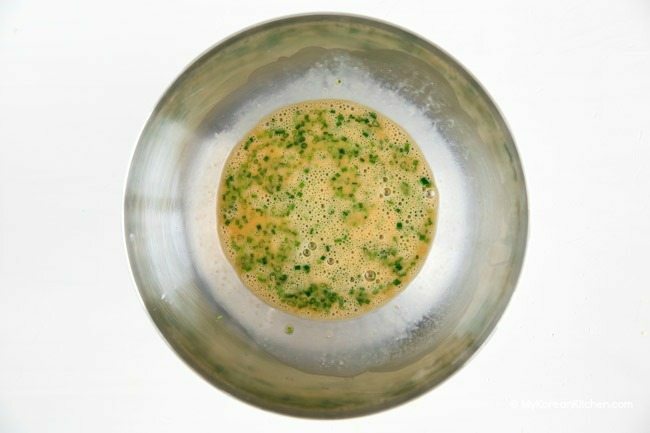 Mix the egg, your choice of vegetables and salt in a mixing bowl. Serve with some tomato sauce/ketchup. Oh, this looks beautiful & ah-mazing, thanks for sharing.